228 years ago, during the War of Independence, a British warship sank in Lake Ontario. The 22-gun brig-sloop HMS Ontario was a few hours into a voyage from Fort Niagara on Oct. 31, 1780 when it went down, killing about 120 people. 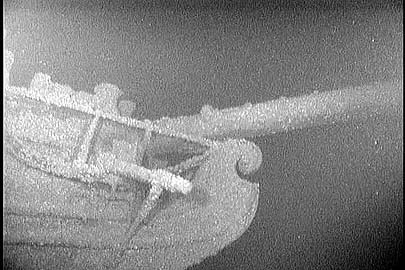 For 228 years, the HMS Ontario lay in deep water between Niagara and Rochester, undiscovered, until now. Jim Kennard and Dan Scoville have discovered the warship, the "Holy Grail of Great Lakes wrecks". It sounds like it's in pretty good condition, considering it sank 228 years ago. The ship's wreck is sitting in mud at a 45-degree angle, he says. "It's a beautiful ship. There are two crow's nests on each of the masts. One even has some of the railing left around it. None of the spars are attached; they've fallen on the deck. There are a couple of anchors, one still on the ship. "Eight of the 22 guns were on the deck. Some are still in place. You can't see the others because the gun ports are closed. It's hard even to see the ports because the hull has a lot of mussels on it. The most prominent parts of the ship are the quarter galleries, a sort of windowed balcony, one at each side of the stern. That was the captain's quarters." Kennard isn't sure why HMS Ontario wasn't more severely damaged. "Who knows what happened? It was a pretty bad storm. Perhaps they were trying to get the ship turned around ... it goes on its side, takes in water, the hatches come off and it fills... It doesn't look as if it went down bow or stern first. It probably settled upright. There could have been trapped air between decks that would have helped the buoyancy. It probably went down quite gently." There are an estimated 4,700 shipwrecks in the Great Lakes, including about 500 on Lake Ontario. The nonfiction story tells us about deep wreck divers that discover a German U Boat off the coast of New Jersey. What an incredible find. I want to become a pirate and find my own treasure.